In the southern Peninsula is a small village named Scarborough. It is situated on the Atlantic coastline and has a magnificent bay where people can swim and relax on the beach. It is most probably the luckiest village in the Peninsula as about two years ago during a winter storm a large freighter the “Ikan Tando “ ran aground on its doorstep. This ship was hard aground on the rocks just off the main beach of the village. Fortunately with the high spring tides that are experienced in the area salvors managed to refloat the ship and drag it out to sea where it was scuttled as it had large holes in its hull. This small village which has no schools is a haven for some of the elderly people of the Western Cape who locate to it to enjoy their twilight years in an area which is full of the indigenous foliage, is home to the Southern Right whales during the winter months, and has troubles with the local baboon population, The indigenous foliage of the area is known as fynbos (Fine bush) and is made up of proteas, ericas and restios or reeds. 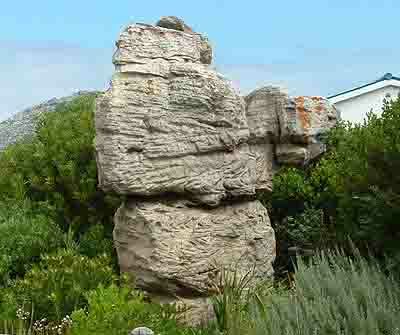 Being just outside of the Cape of Good Hope Nature reserve it benefits from the rules and regulations governing the park. Unfortunately it also takes the good with the bad when disaster strikes as was the case in the last few weeks. A number of disastrous fires have hit the area and the mountains in and around the village have been destroyed. It appears that arson was the cause of the fires which started a short distance from the main road on a day when the south easter gales were at their peak in an area where a casual cigarette thrown out of a vehicle would not have caused a fire if the cigarette had been the cause. 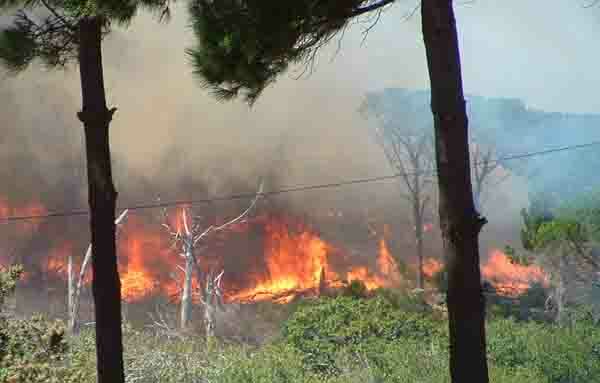 These devastating fires have burnt thousands of hectares of fynbos together with a number of houses in Scarborough. 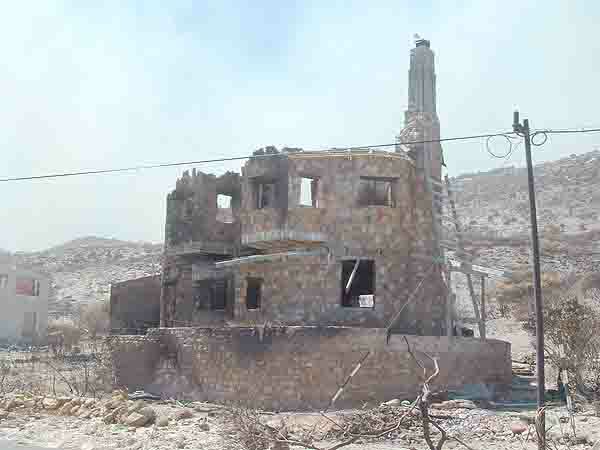 One of the houses that surrendered to the fire was built of rocks which had taken its owner nearly ten years to construct and still had a year or two to go to reach final completion. The house which had a thatch roof did not stand a chance of survival and succumbed with another house close by which also had a thatched roof. 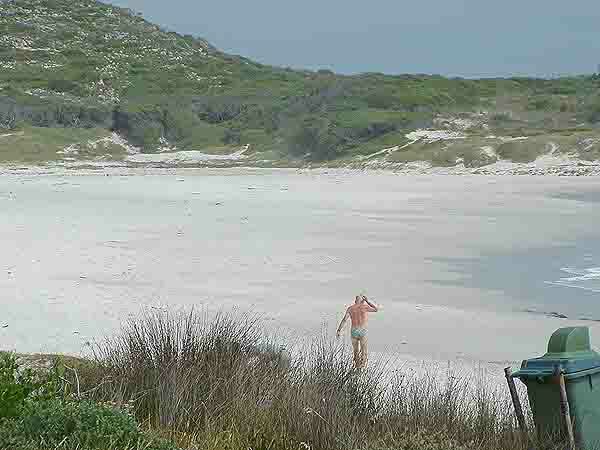 Today the area looks like a moonscape with burnt out protea bushes standing starkly in areas of white sand and rocks. Nature however is a wonderful thing, and it provides for its own. After a number of rain showers seeds and bulbs that have long been dormant have suddenly come alive and within days of the fire grasses and paintbrush lilies are springing up and showing off their beauty. Along the banks of a small stream which runs just inside the boundary of the Cape of Good Hope Nature reserve grasses which escaped the wrath of the fire are attracting game. The red hartebeest which live in the Cape of Good Hope Nature reserve and who managed to escape the fire, have now discovered the green grass along the river and are grazing in this oases in an otherwise burnt landscape. The mountains surrounding the village of Scarborough have also been devastated and the village which already suffers from the ravages of a hungry baboon population will now once again suffer a total onslaught as these protected animals come down off the mountains to seek food. Driving through the village one can see the occasional baboon sitting on a roof of a house just waiting for a window to be left open so that it can enter the house to search for food. 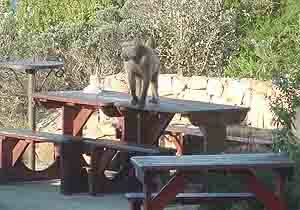 A baboon breaking into your house is worse than a burglary as it will wreck everything it comes into contact with. It is a clever animal and knows how to open doors of fridges and cupboards and when in search of food will throw everything out onto the floor not worrying that it could be of value. Over the years people living in Scarborough have taken action against the baboons by shooting them and in some cases poisoning them as well. Action appears justified when taking into account the damage they cause. Nature conservation however does not agree and anybody caught harming a baboon is prosecuted. 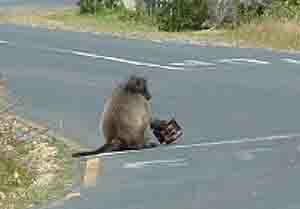 On tours to the southern Peninsula it is not uncommon to come across baboons sitting on the side of the road. They are normally very calm and will continue with their daily lives while people photograph them. The unfortunate part is that a baboon looks cute and so someone will throw it a banana or an apple and after that the baboon becomes a threat. Baboons are quick to learn and next time a car passes they will look for an apple or something to eat and even climb into the vehicle to retrieve food if a window or door is left open. This is where they become dangerous as they will not back off until they have got what they are after. That means that if you have food they will take it from you and if you do not release it will bite you to get it. Once that happens the baboon is doomed and is likely to be shot. Although the runaway fires have devastated the mountains and parks in and around Scarborough it appears that only small animals such as tortoises and snakes have succumbed in the fires. The only larger animal to sustain an injury was a baboon which was so badly burnt that it had to be euthanised. With the changing of the seasons upon us now it won't be long before our winter rains start and then we will see a remarkable change in the veld. The seeds dropped by the proteas and other plants have already been awakened by the fires and will start shooting the minute some rain falls. By the time you visit us towards the end of the year the veld will have recovered and I'm sure that we will once again have a lovely wild flower display for you to enjoy. We look forward to your visit to the Western Cape.